my first full month of blogging is now officially over and it has been so much fun. I have received so much support and kind words from you, that I decided to spread a little love myself. Here is the first edition of my monthly favorites from all across the internet. Not everything is travel related, but I thought you might like it anyway. Enjoy! My favorite Instagram picture this month was taken and uploaded by @sirwanderlust. It’s just so cute and such an unusual angle. I’ve never been so close to an elephant before, so naturally I’m quite jealous. The best Pinterest Find would be the beautifully illustrated maps by Anne Simmons. I’m not sure if I can use here original graphics, but I will definitely ask her, if I can feature them in future blog posts. 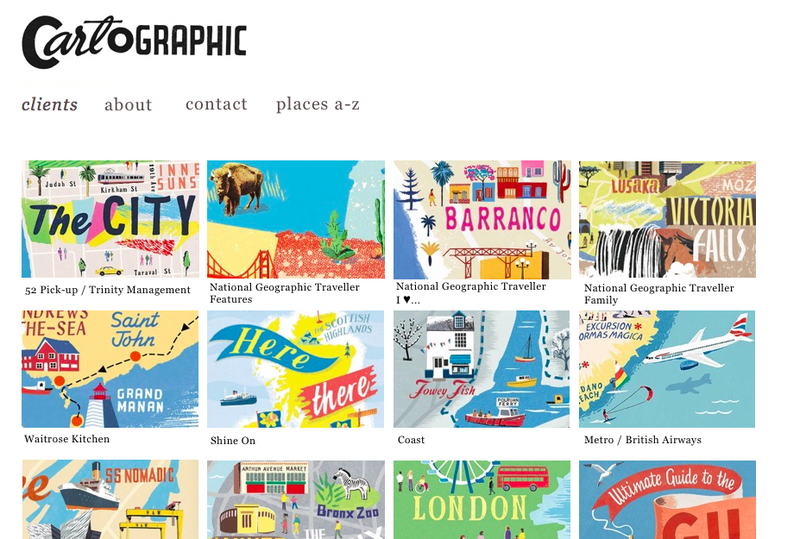 Anne Simmons illustrated countless maps for cities all over the globe for a variety of magazines like National Geographic Traveller and Metropolitan Magazine. My favorite map is, of course, the one of San Francisco. Go check them out! My favorite blog of this month (or probably of all time) is the therebeccaproject.com. Rebecca is an Australian expat living in the best city of the world (which is San Francisco, in case you don’t know me well enough yet). She blogs about the life as an expat, the US, her discoveries and her life in general. In addition to her beautiful writing, her photos are stunning! Oh, and she also makes short films together with her husband. Such a creative and inspiring person (and probably the reason why I started blogging)! My favorite blog post is “5 Things No One Tells Your about Falling in Love Abroad”. A guest post by Julia Golden Sponseller on Young Adventuress. I think, I have mentioned before, how important my study abroad time was and still is for me. Therefore, I regularly read blogs from people who feel the same and write about it. That’s when I found this post and found it to be unique as not a lot of people blog about their love life. I don’t intend to do that either, but I had to learn all of these five points the hard way and I wish I had known them before my study abroad. So check it out, if you’re planning on moving abroad. Speaking of blogging about studying abroad, I am planning to start that soon as well. I want to recap my experiences, tell you what I learned and give some tips. I already posted a piece that I wrote when I first came back to Germany about a year ago (read it here). Next thing will be a guest post, that I’ll share with you as soon as possible! My favorite book this month has been Wild by Cheryl Strayed. I am not going into detail about this book since I am planning to post a more detailed review about this and other travel-related books soon. I’m just saying, this is a must-read for every female traveler! Has someone seen the movie? Is it worth watching? The cutest movie that I watched this month was “Leap year” with Amy Adams. I know, it’s not a very sophisticated movie and it didn’t get the best ratings. But again, it is cute. It’s about an American woman, who travels to Ireland to propose to her boyfriend on February 29th. Her travels, however, get rather complicated and on her way she meets another travel companion and ends up falling in love with him. My favorite Etsy Store this month is YunikDesign. They just make the cutest (travel) mugs. Check them out! My current Netflix favorite is the series Californication. it is very NC-17 and tells the story of the LA-based author Hank Moody, who tries to get his life together for his daugter and the love of his life. Addicting! My favorite Youtube video is “Look up – A spoken word film for an online generation” by Gary Turk. It is a really impressive and goosebump-worthy reminder that we should spend more time of our life offline. And now the geeky part: I love TED talks, especially the science bits. They give me the opportunity to learn about the latest and most impressive research without needing to read even more research papers. So my favorite this month is “Why does the Universe exist?” by philosopher Jim Holt. As you can imagine, it is quite theoretical and philosophical, but still understandable. What are your favorites? And what travel-related books can you recommend? You have a lovely blog! I noticed that you lived in San Francisco! I absolutely love it there! I enjoyed how even in spring months, it’s still sweater weather in most parts! Haha, right? The weather there is so twisted, but that’s a part of what makes it so special. Loved this post. You are well on your way in the blogging world now with your first month over. Good luck! Juliet, this is a wonderful recap of your favorite things. Those Instagram photos are amazing. I also need to check out therebeccaproject blog. I’m actually traveling right now. A quick weekend trip to New York City! Thanks for sharing. That picture of the elephant is amazing! I will definitely be checking out those maps too love them. Love this post, great round-up of lots of really lovely things! Congratulations on your first month as a blogger and thanks for sharing your favorites! I’m looking forward to checking out your favorite blog and easy shop! Glad you liked it! Thanks for stopping by, Allison!